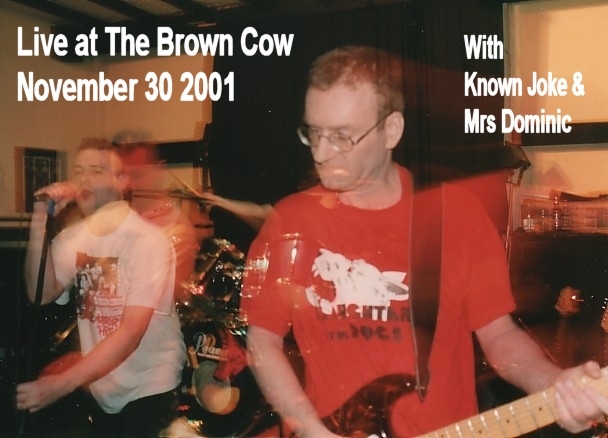 Top times were had at Pointy Boss's tenth gig, at The Brown Cow, Mansfield, on Friday November 30, in an excellent three band line-up also featuring Mansfield's finest Known Joke and London ska-punk-popsters Mrs Dominic. Known Joke opened, to a capacity audience crammed into the upstairs function room at the Cow, with Pointy Boss filling-in the middle spot and Mrs Dominic headlining. All three bands got on famously  sharing and breaking each other's equipment, sharing and drinking the rider, and sharing and spending the receipts from the evening's takings. All three bands vowed to do it again, given half a chance (and depending on the continuing enthusiasm of for-the-love-of-it promoter Stuart  to whom our thanks are sent). Known Joke's report on the gig can be found at their website. Our apologies go out to Mrs Dominic  whose pictures would feature here if we hadn't lost all the shots we had of them (through a bizarre photo-developing accident, in which our Official Photographer Julie lost an entire reel of film). Until we get the chance to do it all again, check out the sites for Known Joke and Mrs Dominic.